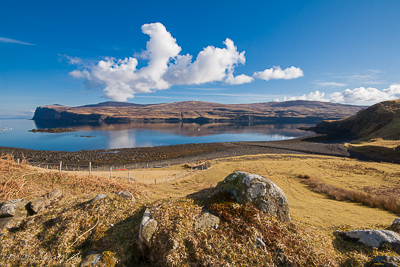 A circular walk from Milovaig to the beach and watermill at Lephin. (5 miles, 3-4 hours). From the Milovaig Pier, turn left (towards Glendale) and follow the road for about 300 yards until you reach a five-bar gate set at right angles to the road (directly in front of Croft No. 1 Lower). Go through the gate and follow the well-trodden track diagonally across the field towards the point where the burn runs down to the bay. Here you will find a gate, leading onto the shore. This is a good place to look for seals on the skerries and the buzzards nesting on the cliff. Cross the burn and climb up the hill to the top of the cliff (the photograph above shows the view from this point). You can then follow well-defined sheep tracks around Loch Pooltiel, keeping to the cliff-top. It can get a little bit boggy in places. As you turn the around the corner, you will see a a few old (still habited) croft houses beside Loch Pooltiel, with a burn descending into the Loch just beyond them. Descend to the level ground between the houses and the shore. Cross the burn (beyond the houses) and then follow it up hill until you reach the (un-metalled) 'road' leading to the croft houses. Turn left and follow this track back towards the Loch, crossing a small wooden bridge, until you reach the next croft house. As you approach, the watermill comes into view on your left. You can follow the road down to it and have a look inside (the door is usually unlocked). From here you can also see the beautiful, black volcanic sandy beach on the opposite side of the river Hamara. Follow the unmetalled road past the croft house, until you reach the metalled road. Then turn left, and cross the bridge over the river. Then follow the right-hand bank of the river down to the beach ( Map ). This is a wonderful place for wild flowers, with orchids, violets, flag irises and primroses. Grey wagtails can be seen bobbing on rocks in the river. From the beach, walk back to the road and turn right. Follow the road until you reach the main Glendale road. You can either turn left here to call at the shops for a cuppa or ice cream, or turn right and follow the road back to Milovaig. The road takes you past a working croft where you can have close views of the highland cattle and shetland ponies. Then on past the school and back down to Lower Milovaig, where you can explore the otter pools and ruined crofts. These are on your right, as you pass the post-box and turn back down towards the pier. The view from this point is spectacular and is the one featured on the home page of this web-site. 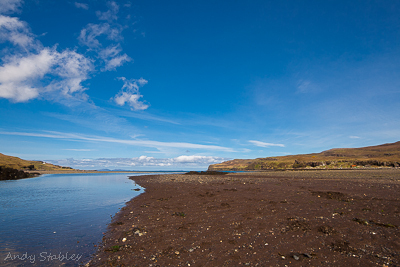 Loch Pooltiel and Dunvegan Head. There were 15 ringed plovers at the mouth of the river Hamara at mid-day (Lynden Schofield). There were two swallows at Feriniquarrie and a greenshank at the head of Loch Pooltiel (Lynden Schofield). The Hamara River at Glendale Beach.